As a well-travelled Registered Nurse who’s worked in Infectious Diseases and the ER, I like to think I can offer sound health advice around travel. Pre-departure prep is a mind-numbing aspect of a trip, but is crucial. No one envisions their epic adventures involving frantic calls home to cover unexpected hospital bills, or being denied entry to a country, for not getting their Yellow Fever vaccine. As a nurse who’s been incurably infected with the travel bug, I’ve got your back here. Here’s what you need to do to keep healthy for a trip, long before you’ve even left home! Be informed about which diseases are prevalent in your intended destination(s). Check your government's website for reputable info here: Australia, Canada, U.S., U.K. and New Zealand. Always direct any questions to your doctor or nurse practitioner (NP), not Dr. Google. Visit your local travel clinic or doctor/NP 6-8 weeks pre-departure to get vaccinated. Some vaccines are multi-dose and must be given weeks apart, so factor this in your timing. 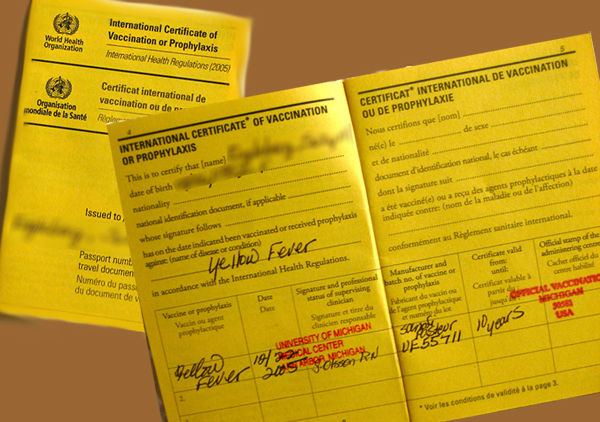 Bring your vaccination record/card (typically a yellow booklet – if you don't have one, ask for one). Note: it pays to shop around for travel clinics, as many charge wildly different prices for the visit and the vaccines. Pack your vaccine card/record to bring travelling. Some countries won't allow entry if you can't prove you've received certain vaccines – see below for details. I can't give one-size-fits-all advice on vaccines here, because different parts of the world have different illnesses. Also, not all diseases have vaccines; some require preventative medication instead (e.g. malaria). Basically, it's super duper important that you don't just take my Internet advice. Have a face-to-face consultation with your health care provider to obtain information specific for your trip. 2. Pack a health kit. Is this something I'll regret not packing if I need it? If I don't pack this, will it be easy to find at my destination(s)? Nausea/indigestion/motion sickness: anti-nauseants like diphenhydrimate (Gravol) or ginger tablets. Antacids like “Pepto Bismul” (Bismuth Subsalicylate) or “Tums” (calcium carbonate). Dehydration: rehydration/electrolyte tablets, or be thrifty and make your own salt/sugar solution (equally as effective). Allergies & skin: oral antihistamine (e.g. Reactine, Allegra), polysporin (for scrapes & skin infections), hydrocortisone cream (for rashes). Most traveller’s diarrhea (and vomiting) is the body’s way of expelling organisms from contaminated food or water. The best management is rehydration, and in hospital we try to treat patient’s first with good ol’ oral rehydration (e.g. juice, Gatorade, Pedialyte). 3. Stock up on prescription medications. This only applies to those travelling long-term who take prescription medications (e.g. oral contraceptives, eye drops). Get an adequate supply for your time away. It's always advised to bring your prescription papers with you, should you be questioned by border or airport security about your medication. 4. Check travel advisories (with a grain of salt). Are travel advisories exaggerated? Yep. But is it good to know of a cholera outbreak so you won’t drink the water where you’re headed? Definite yep! Most travel advisories are pretty sensationalist. You’re told to exercise a high degree of caution for essentially every country on earth. Ultimately though, the information is valuable to knowing specific health and safety issues, including common scams. It’s worth skimming, especially for countries you are unfamiliar with. I'm about as frugal as they come, but gambling on having no health coverage is never, ever worth saving money. No matter how young, smart, or healthy you are, nothing can ensure your invincibility against requiring a clinic or hospital visit, period. Many reviews and successful reimbursements for claims made. Google searching will reveal many such success stories. Personally, a friend of ours was reimbursed for her stolen iPhone. Recommended by travellers and travel companies alike, including Lonely Planet & Rough Guides. Vast coverage, including travel to over 140 countries. You are insured on just about every activity, from adventure sports, white water rafting, to scuba diving. Better yet, what isn't covered is clearly stated on their site. You can sign up for and further extend World Nomads insurance while travelling (few insurers allow this!). Claims are made by simply filling them out online (others will have you jump through endless 1-800 hoops). Beyond health, their coverage includes electronics theft and loss (as described in my article on how to travel safely). As I said, you can sign up for World Nomads while on the road, but I'd recommend doing it pre-departure to ensure it's not overlooked or forgotten when it's too late. These days, preparing for long-term travel isn’t really that complicated, but it is tedious. Plan ahead, adhere to a checklist (potentially this one, should you find it helpful! ), and ensure that nothing important is missed to make the best of your travels! Question or comment on how to prep for your upcoming trip? Leave a thought below!